Endophthalmitis is an inflammatory condition of the intraocular cavities (ie, the aqueous and/or vitreous humor), usually caused by infection. 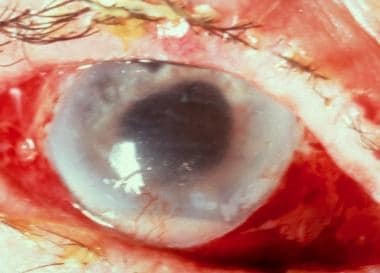 Noninfectious (sterile) endophthalmitis may result from various causes such as retained native lens material after an operation or from toxic agents. Panophthalmitis is inflammation of all coats of the eye, including intraocular structures. Severe endophthalmitis. Courtesy of Ron Afshari Adelman MD, MPH, MBA, FACS, Yale Medical Group. The two types of endophthalmitis are endogenous (ie, metastatic) and exogenous. Endogenous endophthalmitis results from the hematogenous spread of organisms from a distant source of infection (eg, endocarditis). Exogenous endophthalmitis results from direct inoculation of an organism from the outside as a complication of ocular surgery, foreign bodies, and/or blunt or penetrating ocular trauma. Under normal circumstances, the blood-ocular barrier provides a natural resistance against invading organisms. In endogenous endophthalmitis, blood-borne organisms (seen in patients who are bacteremic in situations such as endocarditis) permeate the blood-ocular barrier either by direct invasion (eg, septic emboli) or by changes in vascular endothelium caused by substrates released during infection. Destruction of intraocular tissues may be due to direct invasion by the organism and/or from inflammatory mediators of the immune response. Endophthalmitis may be as subtle as white nodules on the lens capsule, iris, retina, or choroid. It can also be as ubiquitous as inflammation of all the ocular tissues, leading to a globe full of purulent exudate. In addition, inflammation can spread to involve the orbital soft tissue. Any surgical procedure that disrupts the integrity of the globe can lead to exogenous endophthalmitis (eg, cataract, glaucoma, retinal, radial keratotomy, intravitreal injections). Endogenous endophthalmitis is rare, occurring in only 2-15% of all cases of endophthalmitis. Average annual incidence is about 5 per 10,000 hospitalized patients. In unilateral cases, the right eye is twice as likely to become infected as the left eye, probably because of its more proximal location to direct arterial blood flow from the right innominate artery to the right carotid artery. Since 1980, candidal infections reported in IV drug users have increased. The number of people at risk may be increasing because of the spread of AIDS, more frequent use of immunosuppressive agents, and more invasive procedures (eg, bone marrow transplantation). Decreased vision and permanent loss of vision are common complications of endophthalmitis. Patients may require enucleation to eradicate a blind and painful eye. Mortality is related to the patient's comorbidities and the underlying medical problem, especially when considering the etiology of hematogenous spread in endogenous infections. The prognosis is extremely variable because of the variety of organisms involved. The visual acuity at the time of the diagnosis and the causative agent are most predictive of outcome. Streptococcal infections tend to do worse than coagulase-negative staphylococcal infections. The outcome of endogenous endophthalmitis is generally worse than exogenous endophthalmitis due to the profile of the organisms typically involved with this form (ie, more virulent organisms, compromised host, delay in diagnosis). Patients in the traumatic subgroup, especially those caused by Bacillus infection, typically have a poor visual outcome. The prognosis appears to also be related to the patient's underlying health conditions, with one study demonstrating worsened outcomes among diabetic patients. Taban M, Behrens A, Newcomb RL. Acute endophthalmitis following cataract surgery: a systematic review of the literature. Arch Ophthalmol. 2005 May. 123(5):613-20. [Medline]. Durand ML. Bacterial and Fungal Endophthalmitis. Clin Microbiol Rev. 2017 Jul. 30 (3):597-613. [Medline]. Englander M, Chen TC, Paschalis EI, Miller JW, Kim IK. Intravitreal injections at the Massachusetts Eye and Ear Infirmary: analysis of treatment indications and postinjection endophthalmitis rates. Br J Ophthalmol. 2013 Apr. 97(4):460-5. [Medline]. Garg SJ, Dollin M, Storey P, Pitcher JD 3rd, Fang-Yen NH, Vander J, et al. MICROBIAL SPECTRUM AND OUTCOMES OF ENDOPHTHALMITIS AFTER INTRAVITREAL INJECTION VERSUS PARS PLANA VITRECTOMY. Retina. 2016 Feb. 36 (2):351-9. [Medline]. Boldt HC, Pulido JS, Blodi CF, Folk JC, Weingeist TA. Rural endophthalmitis. Ophthalmology. 1989 Dec. 96(12):1722-6. [Medline]. Thompson JT, Parver LM, Enger CL, Mieler WF, Liggett PE. Infectious endophthalmitis after penetrating injuries with retained intraocular foreign bodies. National Eye Trauma System. Ophthalmology. 1993 Oct. 100(10):1468-74. [Medline]. Gokce G, Sobaci G, Ozgonul C. Post-Traumatic Endophthalmitis: A Mini-Review. Semin Ophthalmol. 2015. 30 (5-6):470-4. [Medline]. Lundstrom M, Wejde G, Stenevi U, Thorburn W, Montan P. Endophthalmitis after cataract surgery: a nationwide prospective study evaluating incidence in relation to incision type and location. Ophthalmology. 2007 May. 114(5):866-70. [Medline]. Endophthalmitis Vitrectomy Study Group. Results of the Endophthalmitis Vitrectomy Study. A randomized trial of immediate vitrectomy and of intravenous antibiotics for the treatment of postoperative bacterial endophthalmitis. Arch Ophthalmol. 1995 Dec. 113(12):1479-96. [Medline]. Ness T, Pelz K, Hansen LL. Endogenous endophthalmitis: microorganisms, disposition and prognosis. Acta Ophthalmol Scand. 2007 Dec. 85(8):852-6. [Medline]. Connell PP, O'Neill EC, Fabinyi D, et al. Endogenous endophthalmitis: 10-year experience at a tertiary referral centre. Eye (Lond). 2011 Jan. 25(1):66-72. [Medline]. [Full Text]. Han DP, Wisniewski SR, Wilson LA, et al. Spectrum and susceptibilities of microbiologic isolates in the Endophthalmitis Vitrectomy Study. Am J Ophthalmol. 1996 Jul. 122(1):1-17. [Medline]. Stein JD, Grossman DS, Mundy KM, Sugar A, Sloan FA. Severe adverse events after cataract surgery among medicare beneficiaries. Ophthalmology. 2011 Sep. 118(9):1716-23. [Medline]. [Full Text]. Melo GB, Bispo PJ, Regatieri CV, Yu MC, Pignatari AC, Hofling-Lima AL. Incidence of endophthalmitis after cataract surgery (2002-2008) at a Brazilian university-hospital. Arq Bras Oftalmol. 2010 Dec. 73(6):505-7. [Medline]. Kessel L, Flesner P, Andresen J, Erngaard D, Tendal B, Hjortdal J. Antibiotic prevention of postcataract endophthalmitis: a systematic review and meta-analysis. Acta Ophthalmol. 2015 Mar 16. [Medline]. Alfaro DV, Roth D, Liggett PE. Posttraumatic endophthalmitis. Causative organisms, treatment, and prevention. Retina. 1994. 14(3):206-11. [Medline]. Miller JJ, Scott IU, Flynn HW Jr, et al. Endophthalmitis caused by Bacillus species. Am J Ophthalmol. 2008 May. 145(5):883-8. [Medline]. Verbraeken H, Rysselaere M. Post-traumatic endophthalmitis. Eur J Ophthalmol. 1994 Jan-Mar. 4(1):1-5. [Medline]. Faghihi H, Hajizadeh F, Esfahani MR, et al. Posttraumatic endophthalmitis: report No. 2. Retina. 2012 Jan. 32(1):146-51. [Medline]. Thevi T, Abas AL. Role of intravitreal/intracameral antibiotics to prevent traumatic endophthalmitis - Meta-analysis. Indian J Ophthalmol. 2017 Oct. 65 (10):920-925. [Medline]. Gupta A, Srinivasan R, Gulnar D, Sankar K, Mahalakshmi T. Risk factors for post-traumatic endophthalmitis in patients with positive intraocular cultures. Eur J Ophthalmol. 2007 Jul-Aug. 17(4):642-7. [Medline]. Vaziri K, Schwartz SG, Kishor K, Flynn HW Jr. Endophthalmitis: state of the art. Clin Ophthalmol. 2015. 9:95-108. [Medline]. [Full Text]. Kohanim S, Daniels AB, Huynh N, Eliott D, Chodosh J. Utility of ocular ultrasonography in diagnosing infectious endophthalmitis in patients with media opacities. Semin Ophthalmol. 2012 Sep-Nov. 27(5-6):242-5. [Medline]. Albert DM, ed; Jakobiec FA. Endogenous endophthalmitis. Principles and Practice of Ophthalmology. W B Saunders Co; 1994. Vol 5: 3120-3125. Albert DM, Jakobiec FA. Postoperative endophthalmitis. Principles and Practice of Ophthalmology. W B Saunders Co; 2000. 2441-2462. Mandelbaum S, Forster RK. Postoperative endophthalmitis. Int Ophthalmol Clin. 1987 Summer. 27(2):95-106. [Medline]. Michelson JB, Friedlaender MH. Endophthalmitis of drug abuse. Int Ophthalmol Clin. 1987 Summer. 27(2):120-6. [Medline]. Okada AA, Johnson RP, Liles WC. Endogenous bacterial endophthalmitis. Report of a ten-year retrospective study. Ophthalmology. 1994 May. 101(5):832-8. [Medline]. Parrish CM, O'Day DM. Traumatic endophthalmitis. Int Ophthalmol Clin. 1987. 27(2):112-9. [Medline]. Rowsey JJ, Jensen H, Sexton DJ. Clinical diagnosis of endophthalmitis. Int Ophthalmol Clin. 1987 Summer. 27(2):82-8. [Medline]. Uka J, Minamoto A, Shimizu R. A five-year review of patients admitted with the diagnosis of bacterial endophthalmitis. Hiroshima J Med Sci. 2005 Jun. 54(2):47-51. [Medline]. Wilhelmus KR. The pathogenesis of endophthalmitis. Int Ophthalmol Clin. 1987 Summer. 27(2):74-81. [Medline]. Wilson FM 2d. Causes and prevention of endophthalmitis. Int Ophthalmol Clin. 1987 Summer. 27(2):67-73. [Medline]. Wong JS, Chan TK, Lee HM, Chee SP. Endogenous bacterial endophthalmitis: an east Asian experience and a reappraisal of a severe ocular affliction. Ophthalmology. 2000 Aug. 107(8):1483-91. [Medline].